Books of old photos are a great way of gaining an understanding of what the world was really like before we as individuals were part of it. But if you go back more than half a century a barrier increasingly arises that gets in the way of a modern audience really feeling a part of what they are looking at. We are all conditioned to seeing the world around us in colour, and we have become used to seeing film, TV and images in colour too. For many of us, especially those born after black and white TVs became museum pieces, "monochrome" seems to equate to "inaccessibly distant in time", and suddenly the places depicted seem less real and the people much harder to relate to. 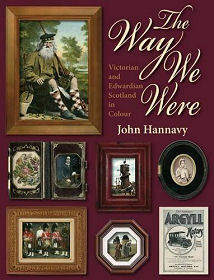 "The Way We Were: Victorian and Edwardian Scotland in Colour" by John Hannavy seeks to overcome this barrier by using, as the title suggests, colour pictures of Victorian and Edwardian Scotland to bring the places and people of the era to life. As the author acknowledges in his introduction, the legacy of our Victorian ancestors is largely in a range of shades of sepia, but as the 1800s became the early 1900s it was increasingly common to find photographs being hand tinted, and printed using colour lithographic techniques. This book accordingly comprises a series of collections of images of both sepia and full colour images. The book is divided into some 20 chapters, each taking a theme. These range from subjects you might expect, such as Scotland's Railways, the Ubiquitous Steamer, Village Life in Scotland and Sports & Outdoor pursuits, through to others you might not expect, such as Scotland's World Fairs, Fisher Folk, and That's Entertainment. The quality of the images that emerged from the early colouring processes varies significantly. Some are fairly crude, but others are amazing pieces of work that could easily pass for a colour photograph. The key question is this: does this approach overcome the barrier to the past described above? The answer is: yes, it does. Pictures of things and places have an immediacy that is difficult to gain from a monochrome image. And pictures of people given the same colour treatment bring them back to life in a remarkable way. It is amazing to look at images of kipper girls in Peterhead or quarrymen at Rubislaw Quarry and see the real people in the pictures, and not just the surface of the pictures themselves. And it is impossible not to smile wryly at the author's suggestion that the reason why the apparently very mundane 1908 colour picture of two women treading their washing in pails sold well at the time was because their knees were on view.